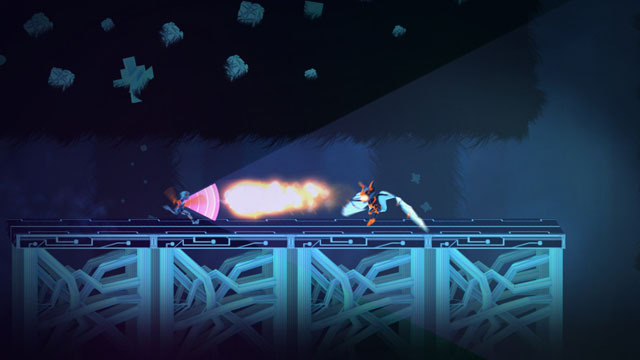 Klang is an unusual game from developer Tinimations, offering a mixture of platforming and rhythm action. You take on the role of Klang, a fellow who has been imprisoned by Soundlord Sonus. Equipped with a tuning fork, you fight your way through enemies with the proper timing to dodge their attacks and deflect sounds back at them. In addition, you must hop across platforms to avoid sound explosions, climb up walls that are constantly being bombarded with energy, and even take on some challenging bosses. The rhythmic timing-based gameplay is backed by EDM composer bLiNd. Klang is now available for PC via Steam.